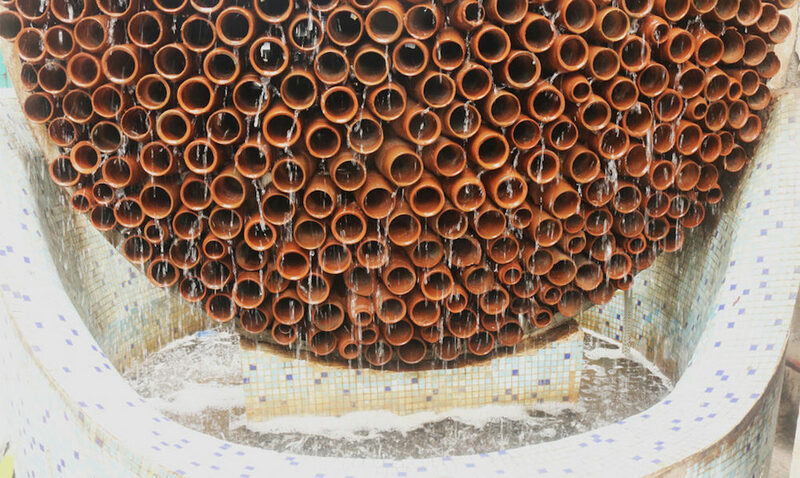 New Delhi-based architecture and design company Ant Studio recently created a completely low-energy cooling system that relies on clay tubes and water as a cheap alternative to traditional air conditioners. The spherical system reminiscent of a beehive was built as a part of a larger beautification project for a DEKI Electronics factory. The simple, low-tech solution adds an aesthetic twist to the typical metal appliance, and requires little upkeep to ensure its surroundings stay cool. In order to cool the air, the system is first packed with a few hundred terra cotta cones. Next, water is poured down the sides of the structure so the clay objects can absorb the liquid as it flows down their sides. Finally the water slowly evaporates from the soaked cones, lowering temperatures around the installation by 6-10 degrees Fahrenheit.